The Museum of Christian Art is one of the few institutions of its kind in Asia. It is run in the former colonial capital of Old Goa, home to heritage monuments today. When it was set up, in 1994, it was the only museum of Christian art in Asia. 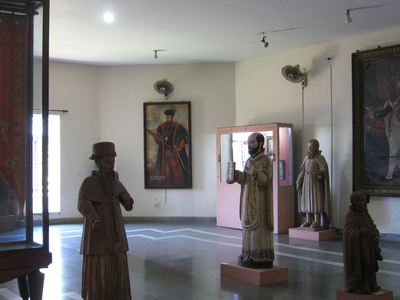 The museum is located in the Convent of Santa Monica in Old Goa, Goa. It is open from 9.30 am to 5 pm on all days, Monday to Sunday. It is a project of the Archdiocese of Goa and was set up with technical and financial assistance from the Calouste Gulbenkian Foundation, Portugal and the Indian National Trust for Art and Cultural Heritage (INTACH), New Delhi. Earlier, it was located at the Seminary of Rachol, Salcete, Goa. The Lonely Planet says: "Within the Convent of St. Monica, the excellent Museum of Christian Art contains statuary, paintings and sculptures transferred here from the Rachol Seminary. Many of the works of Goan Christian art during the Portuguese era were produced by local Hindu artists." Fodors, another travel guide, notes that the museum is located inside the Convent of St. Monica, and "has a number of objects of Christian interest, including paintings and religious silverware, some dating back to the 16th century." It also notes that this convent was the first nunnery of its kind in the East and continued until the late 19th century. Here's the our members favorite photos of "Museums in Goa". Upload your photo of Christian Art Museum! Connect with Raj Francis and Gerald L who have already visited Christian Art Museum.